This was a piece I wrote on May 7, 2010 for the Silicon Valley Moms Blog. After the yesterday's CNN report about Wakefield, I've decided to post it here. Six months ago, Jessica Holt's otherwise healthy seven year old boy, Joey, was sent home from school with a fever. What seemed like a typical flu quickly worsened and she called 911. In the ambulance on the way to the hospital, blood pressure dropping, Joey said "I love you mama. Hold my hand." Then, she said, "he was gone." The boy had contracted H1N1 flu, and wasn't vaccinated. She didn't think it would happen to her. Jessica says she lives "every day with that regret." When I was pregnant with my first child, I read up on the many choices I had to make about my child's care. Cloth diapers or disposable? Hospital or home birth? Circumcise or not? Vaccinate or not? I had no idea that this was a choice. Of course I would vaccinate my son. And I did. But one year ago, my family had two almost simultaneous life changing events: our baby girl was born and my two year old son was diagnosed with autism. Like so many kids newly diagnosed, he had been happy and engaged just months before. He loved peek-a-boo games, said "banana" and "baby," and could point to his adorable outie belly button. He knew his animal sounds. But soon he stopped gaining new words, and by his second birthday, he wasn't saying anything, not even "mama" or "dada" or his favorite "banana." So my husband and I researched. We read the pros and cons, and still decided to vaccinate our daughter. But I stayed out of the discussion, wanting to be accepting of others' choices and not get into an emotional debate. I didn't have the energy to fight that battle. But just the other day, even after the Lancet article was retracted, even after Jenny McCarthy admitted that her son didn't have autism at all, I read a blog post about how it was "proven" that her son's autism was caused by a vaccine. That same night, my husband came home and told me about Joey Holt's death and I got so angry. At least once a month, I see messages from people looking for pediatricians who are okay with not vaccinating. I'm tired of it and I don't want to wait to read another story about a child who lost his life to a completely preventable disease. Why aren't we more afraid of these diseases? In 2002, the World Health Organization estimated that "1.4 million of deaths among children under 5 years were due to diseases that could have been prevented by routine vaccination." Thirty eight percent of those deaths were from measles. That's 532,000 children. The Bill and Melinda Gates Foundation has committed $10 billion over the next 10 years to deliver vaccines to the world's poorest countries, estimating that they'll save 8 million lives. But that is "over there," right? 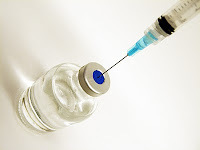 In this country, we have easy access to vaccines but because we haven't seen these diseases up close in a generation, inoculation seems like a luxury we can forego. Our parents grew up knowing kids who were severely disabled by polio, but I sure didn't. Right now, the fear of autism looms so much larger than the threat of measles or whooping cough. Besides, we have good medical care here. When our kids do get sick, we have doctors who can help cure them. I can see how the choice not to vaccinate might seem like a good one. Unfortunately, it seems we are going to learn the lesson the hard way. Last year in Minnesota, three cases of Hib, including a death, "were in infants whose parents refused to vaccinate them. Parents of two children objected to vaccines; the parents of the third child were waiting to vaccinate until the child was 5 years old." Even with the best medical care, these children did not stand a chance. Still, you may think this is a personal decision, made between you, your family and your doctor. Think again. Mariah Bianchi lost her 3 week old son to whooping cough. "To hear about other people who are losing their children that are too young to vaccinate...These babies that are less than 3 months old that are dying never have a chance and it's up to the people around them to protect them." What if my unvaccinated child had exposed her to that disease? Wouldn't I be responsible for that person's death? We have a very clear social and ethical obligation to vaccinate our children, with exceptions only in the most extreme cases. Vaccinations don't cause autism; the research is there. Gerber and Offit, in their paper "Vaccines and Autism: A Tale of Shifting Hypotheses," note that "Twenty epidemiologic studies have shown that neither thimerosal nor MMR vaccine causes autism." Let's stop using fear to confuse parents into making deadly decisions for their - and our - children. If anyone has something to be scared of, it's me. I have one child with autism, and it is heartbreaking. I'm not sure how I could bear it if my daughter was also on the spectrum. Thankfully, so far, she seems to be developing typically. She's crawling and laughing and starting to talk. But we're just a few months away from when things started to go so wrong with my son. I watch her every move, looking for signs, breathing a tentative sigh of relief every time she points to an object or makes eye contact. Her MMR vaccine is next week. Jelly is now 20 months old and developing typically. Paul Offit, who is often criticized by the anti-vaccination movement, has a new book, Deadly Choices: How the Anti-Vaccine Movement Threatens Us All. I had my son vaccinated for the flu w/ H1N1 with great hesiation...I tend to be leary of these kinds of shots. But I did it because our Dr strongly suggested it...in turn we all got them and so far (knock on wood) it has been a good decision. We have dodged 3 rounds of the flu in school already. I loved the way you wrote this post. This post is absolutely excellent! Fabulous writing! I enjoyed reading this. I also found out that my son had autism when my daughter was just a baby. We decided to vaccinate. I would much rather have another child with autism then to lose her to something that was preventable. Ironically, I WANTED to get my daughter the H1N1 shot last year. Her pediatrician's office didn't get it until the end of November--for high-risk patients. It wasn't available until early December for everyone else. My daughter came down with H1N1 at the end of November, just 2 days before the doctor's office received the vaccine. For us, it worked out great! She wasn't that ill with it and now will have life-long immunity. Yay! I do believe that there are some risks with vaccines, but the number of vaccine injuries with far less than the death that would occur by not immunizing--no doubt. I think the number of cases of autism brought about by vaccine injuries makes up an extremely small percent of all cases. This is just my opinion--it not based on any scientific study (Just like Wakefield's study. Of course, his opinion was shaped by over a half a million provided by lawyers to bolster their lawsuits). I appreciate this post so much! My sons are identical twins and have seemed to be on the spectrum pretty much since birth. I've never read any good research that swayed me away from vaccinating. The need to vaccinate applies to all ages. A friend of mine opted not to get a shingles shot because they were so expensive. Then she got shingles and give chicken pox to her 3 week old grandson. He was critically ill for days, but thankfully recovered. Good Morning! Where are your pants? Dogs Are Calming Creatures. Just Not My Dog.